The sepals may fold around the fruit. Malva microcarpa Desf., Malva rotundifolia Auct. Malva parviflora is an exotic annual weed that is dynamic after autumn and winter rains. It is an erect, sprawling or decumbent herb growing up to 50cm high that is covered with rather stiff star-like (stellate) hairs and is woody at the base. Variable, occurring on all soil types; most common in waste places, in sheep yards, around farm buildings, closed yards, watercourses and roadsides. Primarily occurs in southern Australia. The stems are covered with stiff star-like (stellate) hairs and can be erect or ascending (at first spreading horizontally and then becoming erect) and rather fibrous. The leaves are circular and 8-10cm in diameter. The base of the leaf is cordate (heart shaped with a notch at the base), margins are crenate (a margin with shallow, rounded teeth) and it is sparsely pubescent (with a covering of short, weak, soft hairs). The leaves are palmately veined with 5-7 short triangular lobes. The petiole (leaf stalk) is mostly 1.5-12cm long and rarely 20cm. 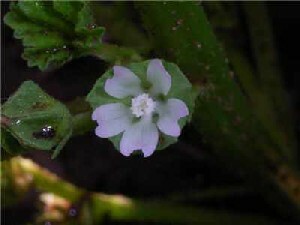 The flowers have 5 petals that are about 4-6mm long, white or pink in colour, and twisted in the bud. The stamens are numerous with filaments fused in a column surrounding the branched style. There are as many branches of the styles as carpels. Malva parviflora has 8-12 carpels. The pedicel (flower stalk) is generally less than 1cm in length at maturity. The 5 green sepals are orbicular (triangular) in shape, with 3 linear bracteoles beneath them. The fruit is a schizocarp (a dry fruit which splits into individual carpels). It is 7-8mm in diameter and separates into 8-12, 1 seeded mericarps. The schizocarp is disc-shaped surrounded by the calyx (sepals of the flower) and brown when ripe. The sectioned fruit (schizocarp) looks like a sliced wheel of cheese, hence the common name of cheeseweed mallow. The fruit of Malva parviflora is a schizocarp, separating into many 1-seeded mericarp (units or segments). M. parviflora can be distinguished from Malva neglecta, Malva nicaeensis and Malva sylvestris in that the corolla (petals of the flower) in these plants is twice as long as the calyx (the sepals of one flower collectively). The corolla of Malva parviflora is approximately as long as the calyx.